Craft beer, aka cerveza artesenal has slowly been catching on in Colombia the last several years. Fortunately, that includes Cartagena. More and more bars seem to be serving at least one brand of craft beer. However, it can still be a little hard to find craft beer in Cartagena. 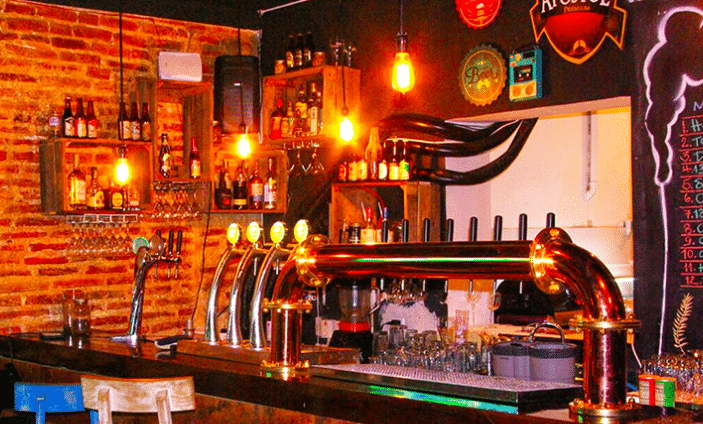 Read on for a list of places where you can find good craft beer in Cartagena. 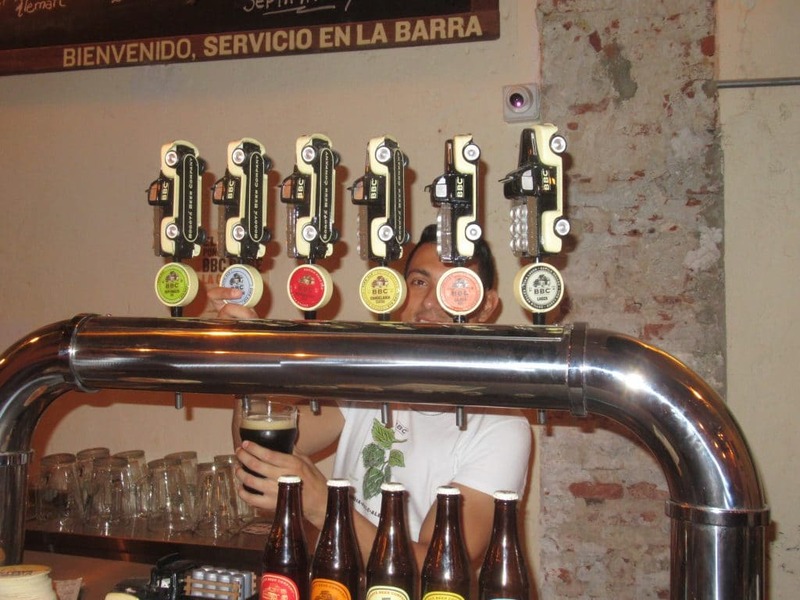 Bogotá is still the Colombian Mecca for craft beer made in country, but as it has become more popular nationally, Cartagena has started to see more and more craft beers available. Many bars and restaurants in the city now serve at least one brand of craft beer, and you might even see BBC beers available at small tiendas. In this post, I’m going to give you the downlow on 5 bars that specialize in craft beer in Cartagena. Three are brewpubs that focus on their own brands of beer and the other two are bars that cater to craft beer lovers with a variety. If you’re a beer fan, at least one if not all of them are worth checking out during your time in Cartagena. 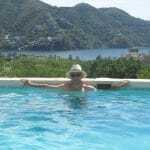 At the end of the post, you can also find a list of other places in Cartagena where you can find craft beer. *Also, be sure to check out our list of the Colombian craft beers you need to try. Several years back, BBC had an awesome spot in Bocagrande right on the waterfront. Probably my favorite place in Cartagena, it unfortunately closed. However, BBC returned to Cartagena in 2018! Although it doesn’t have the great view of the old one, it’s still the best of the best places to get craft beer in Cartagena. BBC is located a block and a half away from the Clocktower. A bit tucked away, if you have your back to the Clocktower, go right off the plaza, take the first left, and it’s a few doors down on the left across from Restaurant San Valentin. Bartender Angel serves up a cold one at BBC, my top pick for places that serve craft beer in Cartagena. One of BBC’s Bodega locations, there is no food on offer here, but the beers are great. They usually have all of BBC’s 4 signature beers on tap. Those are the Premium Lager, Cajicá Honey Ale, Monserrate Roja Red Ale, and Chapinero Porter. All are great, although I’m a bit partial for dark beers and the Chapinero is a real solid porter and I like the Cajicá a lot too. They also have several seasonal beers. My favorite BBC beer is the seasonal Septimazo IPA. IPA’s are particularly tough to find in Colombia, and the Septimazo is a great, hoppy, example of one. If you’re lucky enough to be there when they have it on tap, be sure to try it! A pint at BBC is 9-10,000 pesos, cheaper than any of the other places you can get craft beer in Cartagena. The best craft beer in Cartagena, and the cheapest, what’s not to love? Check out BBC’s website here. 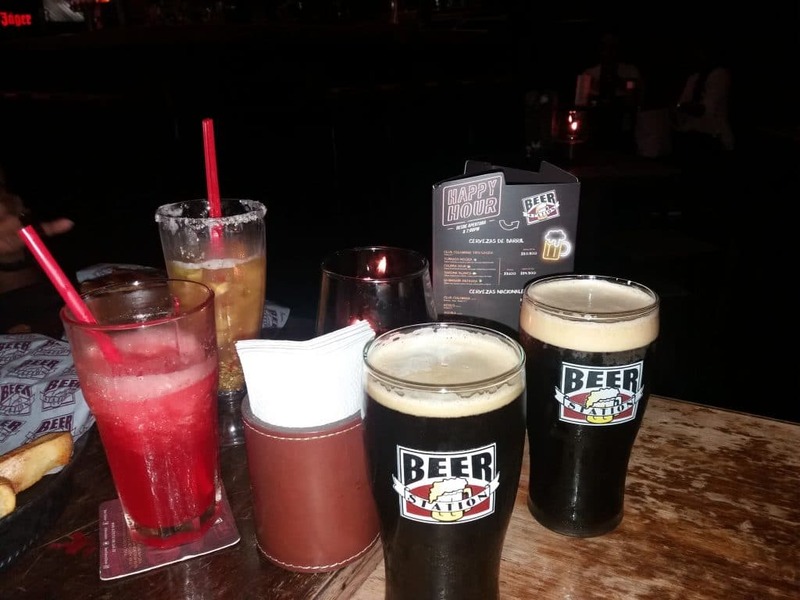 Before BBC reopened, Beer Lovers had become my go to spot to enjoy craft beer in Colombia. They have the best selection of craft beer in Cartagena. If you are in fact a beer lover, the huge refrigerator and different beer bottles up on the walls makes this a must visit. They also always have a good selection of beers on tap. Besides the huge selection in the cooler to the right, Beer Lovers always has lots of variety on tap, making it one of the best places to find craft beer in Cartagena. 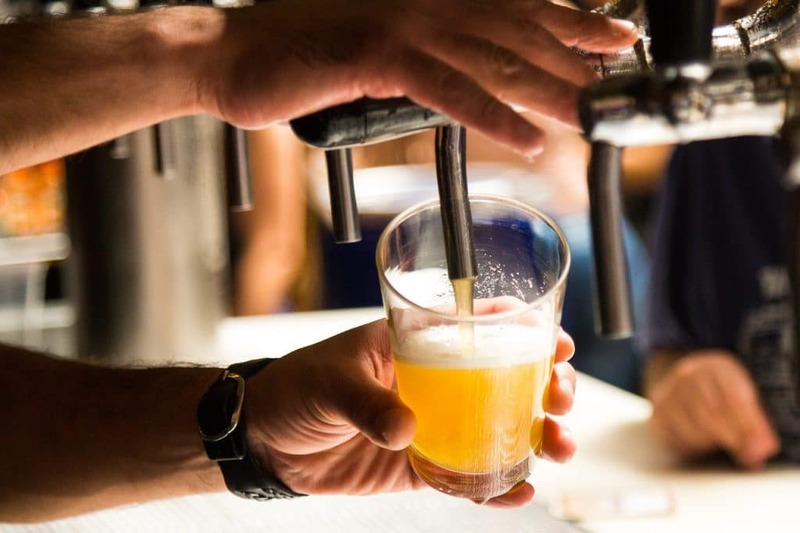 The best thing about Beer Lovers is that huge selection, and you’ll be able to find Colombian made craft beer as well as international beers here that you won’t find anywhere else in the city. Before you go, be sure to check out our list of the best Colombian craft beers to help you make your choice. I recommend trying one of the beers from Chelarte, who have a great marketing ploy with each beer having a woman’s name with a persona that matches the beer style. Especially good is the Naari IPA (if you haven’t caught on, I’m a big IPA fan). Centrally located, a block away from Plaza Santo Domingo on Calle la Factoría, Beer Lovers also sports a good bar food menu. 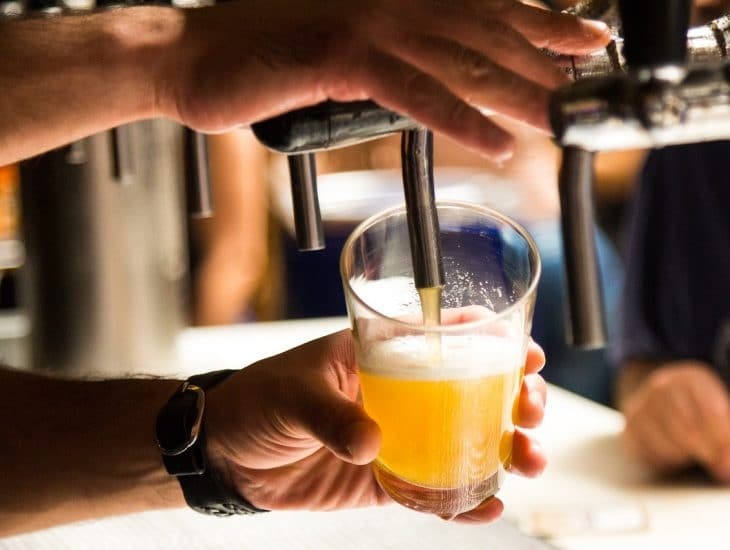 While you have to pay a bit of a premium for the rare beers on offer here, if you’re looking to sample a variety of craft beer in Cartagena, it is hands down the best option. Particularly nice as well is the servers actually know the beer and can tell you about the styles. All of that makes it one of the top places with craft beer in Cartagena. Check out Beer Lovers’s Facebook page here. 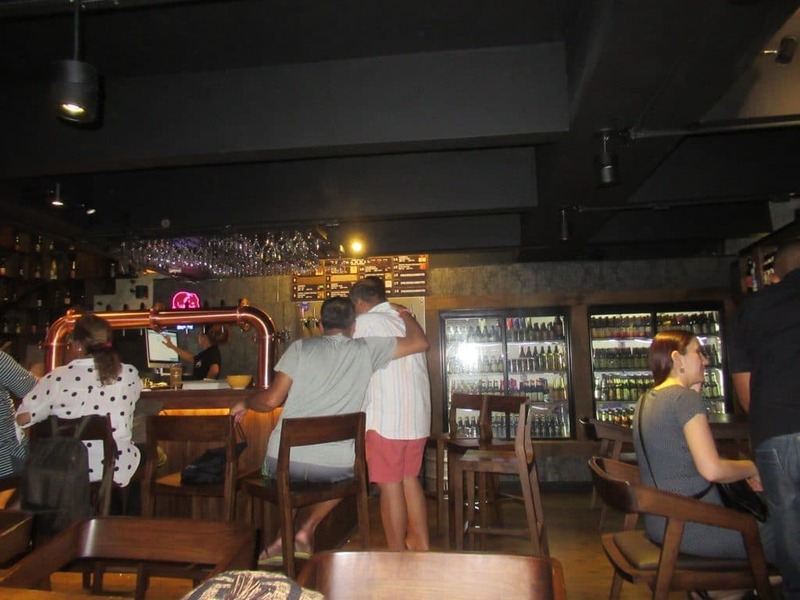 When I first arrived to Cartagena as a volunteer English teacher in a small town near Playa Blanca back in 2011, Beer Station was the only place in the city serving up authentic and good craft beer. Being just up the road from where I had to catch the bus back out the island, I spent many a Sunday afternoon there before making the trek back to town. Therefore it has a special place in my heart. However, located in the Caribe Plaza shopping mall, it is a little outside the tourist zone and with BBC and Beer Lovers in Old Town, it might be a little out of the way for visitors to Cartagena. However, with their beers brewed by Tres Cordilleras Brewery, Beer Station is still a top choice for where to get craft beer in Cartagena. Beer Station also has an extensive cocktail menu and good bar food, but its main draw is as one of the places where you can get good craft beer in Cartagena. They serve up 4 beers on tap: the Quimbaya Light (lager), Tairona Rubia (blond ale), Calima Roja (red ale), and Tumaco Negra (stout). The Tumaco is the best stout brewed in all of Colombia, at least according to my tastebuds. Beer Station is also a great place to catch a soccer match if Colombia happens to be playing during your visit, and has great burgers. Oh and they are the only place I know of in Cartagena that has Jalapeño Poppers! (ok that’s probably more exciting for me as an expat than for a visitor who wants to enjoy Colombian food, but still). Check out Beer Station’s website here. 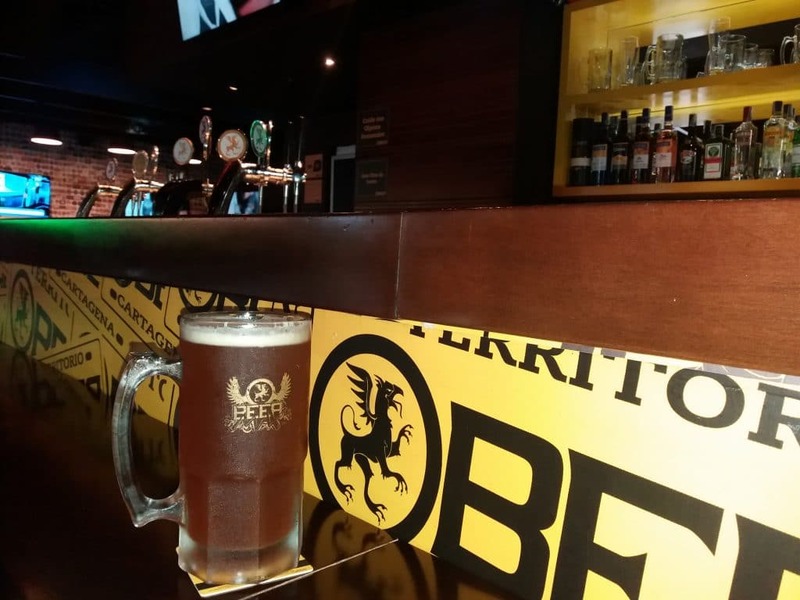 Keeping with the theme of bars located in shopping malls, Territorio BEER is located in Mall Plaza just outside of Old Town. While also perhaps off the tourist beaten path, it does make for a great stop to cool off with a refreshing brew on a walk back to Old Town after you visit Castillo San Felipe. BEER offers a line of 4 standard beers on tap: Rubia (blond ale), Ámbar (pale ale), Roja (a not very hoppy IPA), and Negra (brown ale). They also have a few premium beers: the Imperial IPA is very good as is the London Beer (an excellent stout). The Beer Max liter is a great deal at Territorio BEER, the last of our top picks for where to find craft beer in Cartagena. The Beer Max liter size of their standard beers is probably the best deal on craft beer in Cartagena. BEER also has a menu of bar food, although honestly I’ve never been very impressed by the food. Still, if you happen to be going by the mall, it’s another good choice where to get craft beer in Cartagena. Check out BEER’s website here. Opened fairly recently, Cartagena Craft Beer is nestled in Getsemaní just off of Plaza de la Trinidad. Head down the same street where Demente is on the corner and you’ll see it on the left. With 20 taps, they just edge out Beer Lovers as the place with the largest possible selection when they can get different stock for all 20. In an interesting twist, they serve sushi, along with some standard bar fare. While you’re paying a tad of a premium for the selection, if you’re in Getsemaní and looking to try a variety of different beers that are harder to find elsewhere, CCB is still a great option for where to get craft beer in Cartagena. Clock Pub- Located just inside the Clocktower to the right, Clock Pub is a popular spot for foreign expats and usually have BBC and other craft beers available. There’s also fooseball and even a dart board! El Bistro– Also, in Centro, El Bistro has great food and does a great happy hour. They also usually run specials on the German style Colombian craft beer Apostol. Bourbon Street- Bourbon Street located on the Plaza Santo Domingo also usually has BBC bottles and sometimes other Colombian craft beers. La Pepita– An American style bar and grill, La Pepita has locations in Old Town and in Bocagrande and serve up solid burgers and have BBC bottles. Leon de Baviera- German style pub, Leon de Baviera on Calle Arsenal serves up Paulander. While not craft beer per se, it is a different and hard to find beer. They also have awesome German brats and sauerkraut. Casa de la Cerveza- Located in a great spot atop the wall at the end of Calle Aresenal, Casa de la Cerveza serves up craft beer, although it pales to the options available in the places listed above. Still, it’s a great spot to enjoy the view and get a different style of brew. Mona Lisa Pub- Located in Old Town near Plaza Santo Domingo, Mona Lisa often has craft beer on hand and has a neat little bar atmosphere. Crepes and Waffle- All Crepes and Waffles locations serve BBC. Alquimico– More known for their cocktails, Alquimico does always have a rotating BBC beer on draft. I’m sure this list is far from complete. Anywhere else, don’t be afraid to ask, “Hay cerveza arsenal?” If you do find another good spot serving up craft brews, let me know in the comments below, you’ll be doing a great public service! Ready to plan your trip to Cartagena? This entry was posted in Eats and Drinks, Expat Corner. Bookmark the permalink.